What if I told you that there was a certified organic juice that was so packed with superfoods, vitamins, and magic that it would boost your immune system, increase your energy, and keep you young? Would you rush out to buy a bottle or suspect some deceptive marketing claims? Live Forever Juice is a fake product and brand developed by consulting firm FDA Imports, to generate interest and awareness about FDA labeling compliance. They launched the whole thing as a legitimate product (there was no actual juice); the goal was to generate discussion about claims and FDA labeling compliance. They even launched a full Live Forever Juice website and social media presence to go along with it. Jon Barnes, Digital Communications Strategist, FDAImports.com, was kind enough to share a little Q&A with us about the prank and what they want to accomplish. 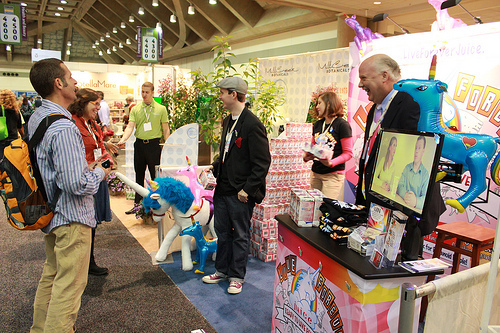 We pranked thousands of people at the expo from CEO’s and executives at large food manufacturing companies to supplement distributers, brokers and independent natural food store owners. 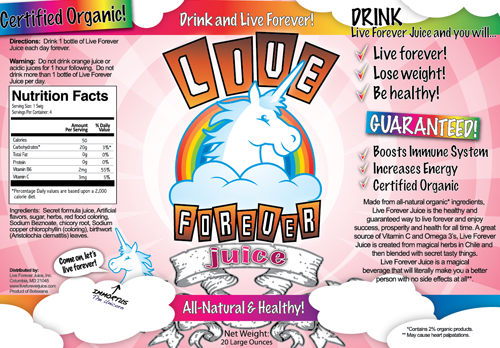 We hailed our juice as “the only all-natural immortality supplement made from 100% sustainably harvested unicorn sweat.” We looked people right in the eye and told them with a straight face that if they drank our juice they would never die. And if they did die that they could bring the box back and we’d refund their money. We even told that to the FDA when they came by our booth. It was… memorable. Finally either laughter or appreciation. Out of the thousands of people we talked to a small handful of folks did not understand it. They may have been blinded by the sheer brightness and sparkle that our display was giving off, we can’t be sure. But overall people were extremely engaged with what we were doing and wanted to hear more about it. The press and show sponsors also picked up on it immediately and enjoyed what we were doing since the field of FDA compliance and consulting does not usually strike people as the most fascinating of endeavors. We’re not your typical firm so that’s why we did what we did. We were all really pleased with the outcome. Have you seen the kind of results you were expecting? We were actually shocked by how enthusiastic people were in responding to the Live Forever Juice project. A big trend in the organic and natural products industry is the protection of “organic” claims so that companies can’t just slap that label on whatever product they’re producing just because they want to. The industry itself is up in arms about how domestic and foreign companies are green-washing their food, supplement or cosmetic products to appear organic or all-natural when in reality it’s just the same old stuff. We found a welcome reception with those audiences. We also found strong support and connection with small and mid-sized companies who were in need of help with FDA compliance issues and saw us doing something creative. How did you get away with this? Thankfully we have a CEO who is creative and forward thinking (Benjamin England). He gave the green light to this project months before the expo and we decided that if we were going to do it then we were going all in. Once our printed items and website started to take form we were all shocked at both how wild yet engaging our project was. People are still talking about it months later. In terms of how we “got away with it,” we just launched it with a straight face and decided to play it by ear. It was obvious in the first few hours of the expo that it was a hit and then I think we all relaxed a little- people were getting it. We always have something creative that we’re cooking up. Currently we’re still cultivating the Live Forever Juice project online and seeing where that’s going to go. We’re also blogging regularly and doing our part to keep the realm of FDA compliance consulting relevant and interesting. I can tell you that if we have an opportunity to do anything with unicorns that we’re going to jump on it.